This great set from Airfix is currently listed as 1/76 scale although it has been previously listed as 1/72 scale. It is compatible with 1/72 aircraft and figures and is an ideal addition to any RAF diorama. 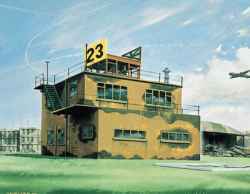 The focal point of operations on any wartime airfield was the control tower. Often a distinctive feature situated in a prominent position adjacent to the runways, the tower housed most of the vital back-up services required to keep aircraft operational. In it was located air traffic control, the meteorological office, the teleprinter room, and general offices for day-to-day operations. Various types of tower were built, ranging from small brick two-storey buildings usually found on fighter stations dating from pre-war days to the large multi-storey buildings seen on airfields today. The model is based on a design common to Allied bomber bases in Britain during the Second World War and the suggested camouflaged scheme, known as the Mickey Mouse pattern, was adopted by some RAF stations from early in the war. With the diminishing need for camouflage as the war drew to a close, newly-completed towers were seen in a grey colour dictated by the rough cast finish while others gradually displayed a dilapidated exterior as the colour faded and weathered. The interior of the building was usually finished in cream or green. Also included are 3 "Duty Crew" figures.